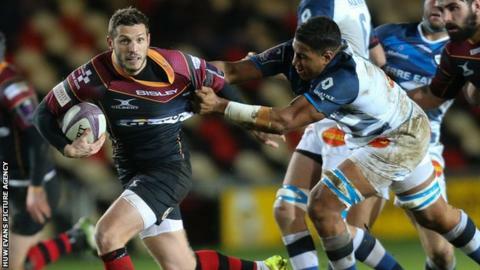 Newport Gwent Dragons maintained their lead in Pool Two of the Challenge Cup with a bonus-point win over Castres. Hallam Amos crossed less than a minute into his comeback, while tries from Nic Cudd and Lewis Evans gave the Dragons a 24-10 half-time lead. The home side found it hard going despite a 58th minute red card for Alexandre Bias, before Ashton Hewitt scored the vital fourth try. Dragons stay two points clear of Sale Sharks, who won 27-3 at Pau. The top two face each other in the final round of matches on 21 January at Sale's AJ Bell Stadium, with the five pool winners and three best-placed runners-up qualifying for the quarter-finals. The Dragons showed their intent from the start as a Castres knock-on allowed Sarel Pretorius to start a counter-attack and Jason Tovey to work Amos clear. Cudd then smuggled his way over from a driving line-out maul and Evans crossed from close range. Tovey converted all three touchdowns. David Smith shot over in the final minute of the first half for a converted score that seemed to turn the tide in favour of the French. Lock Christophe Samson charged in after 50 minutes after some snappy handling and a Geoffrey Palis penalty on 56 had the home side rocking at 24-18. Two minutes later, Castres were let down by their discipline as replacement lock Bias put in a reckless head and shoulder charge on Phil Price, and referee Peter Fitzgibbon brought out a red card. French woes deepened as replacement prop Eric Sione saw yellow for a clumsy challenge, but the Dragons laboured to press home their advantage. Eight minutes from time they finally cracked the Castres defence, with a Taulupe Faletau charge producing the chance for Hewitt to grab the loose ball for the crucial fourth. Tovey converted for an 11-point haul to go with his man-of-the-match award. "We wanted to play with ambition and not kick the ball too much. "We had them under pressure and played good rugby. Our errors in the second half were 60% and we can't make that many errors, it was poor. "We're still top of the group and hopefully we'll go to Sale on a positive note and have a go there." Dragons: Meyer; Hewitt, Hughes, Warren, Amos; Tovey, Pretorius; Price, Dee, Harris, Hill, Landman (capt), Evans, Cudd, Faletau. Replacements: T Rhys Thomas, Stankovich, Knight, Screech, Jackson, Davies, O'Brien, Scott. Castres: Palis; Sivivatu, Combezou, Cabannes (capt), Smith; Fontaine, Seron; Diarra, Babillot, Caballero, Desroche, Samson, Martinez, Rallier, Taumoepeau. Replacements: Sione, Beziat, Wihongi, Hannoyer, Bias, Wulf, Urdapilleta, Lamerat.